Around 4,000 people gathered for the launch of the Reformation 2017 celebrations in Wittenberg, Germany. NOTE: We have separated the three Tuesday’s World News articles into separate posts, with one in place of today’s Daily News Article. Of the 2.2 billion Christians in the world, 50 percent are Catholic, 37 percent are Protestant and 13 percent are Orthodox, according to the Pew Research Center. (from Deutsche Welle, DW.com, Oct. 31) – Germany celebrated the 500th anniversary of the Protestant Reformation on Tuesday, October 31 with a national holiday and ceremonies in the eastern city of Wittenberg, where Martin Luther began a split in the Catholic Church that transformed Christianity and Europe. “Luther Posting the 95 Theses,” 1872, by Wilhelm Ferdinand Pauwels, a Belgian history painter who lived and worked in Germany. German Chancellor Angela Merkel, President Frank-Walter Steinmeier and Saxony-Anhalt state Premier Reiner Haseloff attended several ceremonies in Wittenberg that started with an afternoon church service in the city’s Castle Church and concluded with a ceremony in the city hall in the evening. Other German politicians and numerous international guests also attended ceremonies in the city. In remembrance of the 500th anniversary, Reformation day was a public holiday in Germany this year. 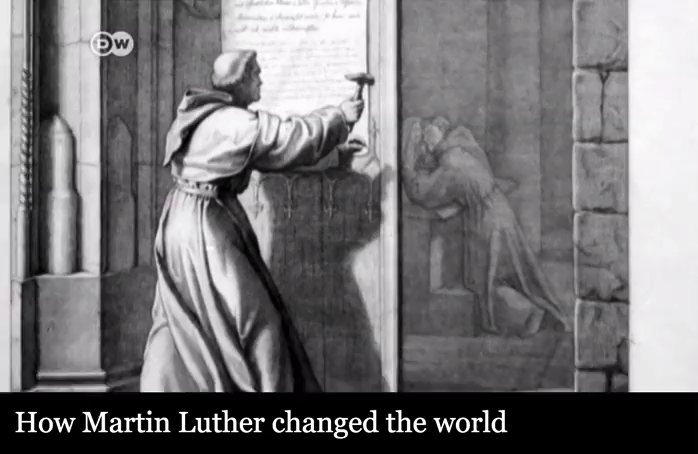 Luther (1483-1546), a theology professor and priest, questioned the Catholic Church’s teachings and challenged the Vatican’s authority through his “95 Theses.” He is believed to have nailed the theses to the door of Wittenberg’s Castle Church on October 31, 1517. 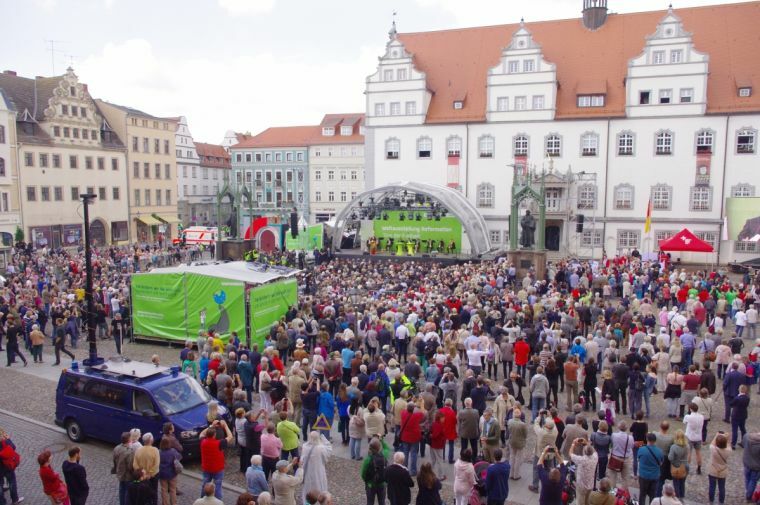 Performances by musicians and comedians took place in Wittenberg’s historic city center throughout the day. Several other events, exhibits and church services were also held across Germany to mark the anniversary. On Monday (Oct. 30), members of Berlin’s protestant youth organization nailed their own theses to the doors of around 300 churches in the German capital. Berlin state youth pastor Sarah Oltmanns told protestant news agency EPD that the youths prepared their church reform suggestions for two years in workshops and other events. b) What did people in Germany do to mark the 500th anniversary of Luther’s 95 Theses? c) What were the two central beliefs of Martin Luther’s 95 Theses? d) What do you think of these ideas? CHALLENGE: Read Martin Luther’s 95 Theses at gutenberg.org. Luther’s writings changed the course of religious and cultural history in the West. In early 16th-century Europe, some theologians and scholars were beginning to question the teachings of the Roman Catholic Church. It was also around this time that translations of original texts—namely, the Bible and the writings of the early church philosopher Augustine—became more widely available. Augustine (340–430) had emphasized the primacy of the Bible rather than Church officials as the ultimate religious authority. He also believed that humans could not reach salvation by their own acts, but that only God could bestow salvation by his divine grace. In the Middle Ages the Catholic Church taught that salvation was possible through “good works,” or works of righteousness, that pleased God. Luther came to share Augustine’s two central beliefs, which would later form the basis of Protestantism. Meanwhile, the Catholic Church’s practice of granting “indulgences” to provide absolution to sinners became increasingly corrupt. Indulgence-selling had been banned in Germany, but the practice continued unabated. Committed to the idea that salvation could be reached through faith and by divine grace only, Luther vigorously objected to the corrupt practice of selling indulgences. Acting on this belief, he wrote the “Disputation on the Power and Efficacy of Indulgences,” also known as “The 95 Theses,” a list of questions and propositions for debate. 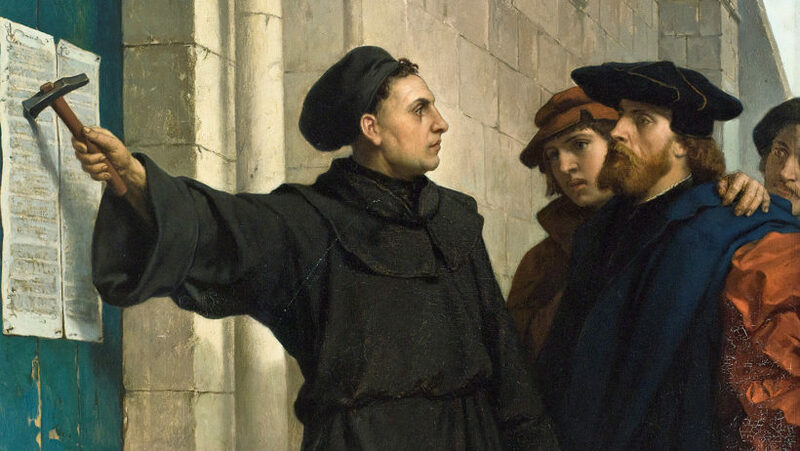 The 95 Theses, which would later become the foundation of the Protestant Reformation, were written in a remarkably humble and academic tone, questioning rather than accusing. The overall thrust of the document was nonetheless quite provocative. that God intended believers to seek repentance and that faith alone, and not deeds, would lead to salvation. Visit luther2017.de/en/ for information on the 500th anniversary of Luther’s 95 Theses. Read a basic summary of Luther’s 95 Thesis.